Discussion in '9/11' started by Mick West, Nov 23, 2016. Peter Michael Ketcham, an iPhone app developer from Wisconsin, has a masters degree in mathematics and worked as a mathematical data visualization programmer at NIST from 1997 to 2011. He had no involvement in the 9/11 investigation (or any other investigation), and has no background in structural engineering or physics. I was a member of the NIST technical staff during the period 1997- 2011. I initially joined the High Performance Systems and Services Division and later became a member of what was, at the time, the Mathematical and Computational Sciences Division of the Information Technology Laboratory. My fellow NIST employees were among the finest and most intelligent people with whom I have ever worked. Second, in its reports, NIST makes a great show of details leading to collapse initiation and then stops short just when it becomes interesting. The remainder of the explanation is a perfunctory statement that total collapse is inevitable and obvious. It is easy to see through this tactic as avoidance of inconvenient evidence. In response to any challenges, NIST has provided curt explanations from its Public Affairs Office. There were many contributors to the NIST WTC investigation: Why not let them openly answer questions in their own voice with the depth of knowledge and level of detail that follows from the nuts and bolts of their research? Lastly, awareness is growing of the disconnect between the NIST WTC reports and logical reasoning. The level of interest in "15 years later" is a good example. So what we have here is just some guy who watched the 9/11 documentaries, and became convinced by them. Nothing wrong with that per se, the documentaries can be quite convincing - most documentaries are, that's their function. But he's just some guy, like me (I've even done work on computational fluid dynamics, and developed iPhone apps). The fact that he worked on mathematical visualizations at NIST is entirely irrelevant. It's an example of an appeal to false authority. AE911 are claiming that there's something significant here because, as their email headline puts it "BREAKING NEWS: Former NIST Employee Speaks Out". Among the most egregious examples is the explanation for the collapse of WTC 7 as an elaborate sequence of unlikely events culminating in the almost symmetrical total collapse of a steel-frame building into its own footprint at free-fall acceleration. "Free-fall acceleration" is something that AE911 say is evidence of controlled demolition, but it's also something that is in the NIST report, and is explained by the mode of collapse (the interior collapses first, then the exterior columns have no lateral support, so they buckled, leading to near zero resistance for at least part of the collapse). "An elaborate sequence of unlikely events" is in reference to NIST's description of a likely initiating incident, where thermal expansion of floor beams pushed a girder off its seat, starting the collapse. AE911 like to portray this as NIST saying this is the only possible thing that could have caused the collapse, so they nit pick the simulation, saying the seat was an inch wider, and it had stiffener plates welded to it making the failure condition distance greater, or they argue about the exact amount of thermal expansion, and they point to other differences between the NIST model and building plans, like the absence of sheer studs on the beams. AE911 (and presumably Mr Ketcham) say that because they have found these problems, then the entire NIST report is wrong. But by focussing on this one initiating incident (which may or may not have taken place) then move focus away from the bigger picture which was that NIST had identified multiple structural failures from the fires, any combination of which could have led to eventual collapse. In fact in the full scale simulations that NIST performed, the girder in question is not part of the initiating incident, so AE911's hyper-focussed objections are moot. Mr. Ketcham, like most people in the 9/11 "Truth" movement, means well. But he's really just some guy who has been convinced by AE911's arguments. Like me, he has no training or experience in structural engineering or physics, so there's no reason to accept his argument based on his experience any more than you would accept mine. 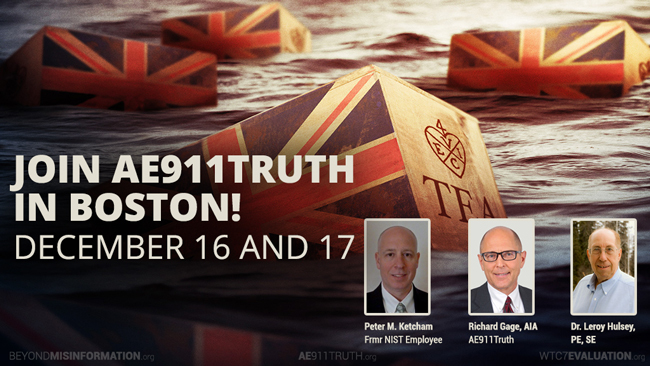 AE911 at its very core engages in false authority. Many 9/11 truthers incorrectly assume that AE911's entire membership is comprised of architects and engineers who have the expertise to analyze the evidence based upon a specific skill set. How many in their organization have worked on steel structures similar to those which collapsed on 9/11. I know a number of people who were convinced by the sheer numbers of "experts" who signed onto AE911. They constantly assert that all those experts could not be wrong. The AE911 website touted a membership of 2,000 back in 2013 (I'm sure there are greater numbers today). However, I have never seen a relevant breakdown of their membership i.e. how many members are structural engineers and architects with steel-framed structure expertise. And how many in that number have been involved in erecting buildings similar to the Twin Towers and WTC7? Mick, have you ever seen a membership breakdown of AE911, or by contrast the number of A&E who disagree with Gage and company's findings? AE911T actually claims 2000 architects and engineers, and counts others separately. This however is itself misleading as most of those 2000 do not have structural engineering or high rise architecture backgrounds . I don't recall anyone on their list having experience or training in fire engineering, which is THE most important damage effect in play in all three structures that AE911T concerns itself with. The sole fire 'analysis' I am aware of that has been done for AE911T , was performed by a carpenter, thus not one of the 2000, based entirely on one line in the text of the WTC7 NIST report. Unfortunately, I lost my main database a couple of months ago when my notebook computer was stolen - it was too large to be kept in the Cloud, and I had neglected to do other backups in a couple of years or so. Every couple of months - when I feel like doing it again - I download the entire roster of A&Es (2723 signatures today and counting) and tidy them a bit in a spreadsheet. With my master database, I was able to spot new and deleted entries and do all kinds of break-downs. Sigh. Anyway: My last spreadsheet (Nov 13) has 439 licensed architects in the USA, and 510 licensed ("professional") engineers (PE) in the USA. There are more unlicensed A&Es - unlicensed architects do not practice as architects, and unlicensed engineers most often are in those branches that usually do not require licensure because they are not a matter of public safety, e.g. mechanical or software engineers. To practice civil and/or structural engineering, you must be licensed. A little more than half of the PEs are civil or structural engineers - that would currently be roughly 280 or so. Add to that 642 foreign engineers and architects, which are all lumped together - I don't have a current count or estimate how many of these are civil/structural engineers. Very few are fire protection engineers. HOWEVER merely counting by relevant on-paper qualification doesn't give you the number of "EXPERTS". An expert is a person who not only has the relevant education and professional experience (250-500 signers might fall under those categories, if you feel magnanimous) but is also sufficiently familiar with all the pertinent facts of the subject matter. That is where almost all of the signatories fail. If you read their personal statements at random, you walk away with the sure feeling that they have informed themselves only through Truth Movement filters. They make explicit reference only to Truther talking points, not the real academic and professional discourse. "Second, in its reports, NIST makes a great show of details leading to collapse initiation and then stops"
"Among the most egregious examples is the explanation for the collapse of WTC 7 as an elaborate sequence of unlikely events"
it is as if two fully loaded commercial jet liners smashing into the towers within the space of an hour was somehow an everyday non bizarre occurrence. The formal fallacy here is something else: After the fact, the probability of the fact occurring the way it actually did is 100%, regardless of how low the probably may have been before the fact. The chance of winning the lottery jackpot is extremely low, but once someone actually won it, it would be a fallacy and a folly to claim they didn't win it because chances ex ante were so low. Before the fact, the chance of a random office highrise to fail via mechanism X is very low, mechanism Y is very low, mechanism Z is low. Even the joint probability of X, Y or Z occurring may be low for any one building. That doesn't mean all three are impossible - they still have positive, non-zero probabilities. So eventually, when enough office highrises burn as severly as WTC7 did, X, Y or Z are bound to happen. Another FALSE claim. They have no evidence for this. I fact, the extremely slow growth of AE's own petition geared towards "scientific and technical professionals" is evidence that refutes the claim. Currently, less than 0.05% of the professional engineers within the relant branches of engineering have signed up, and at the pace they have been growing in the past five years, it would take them like ten to twelve years to double that number. And that growth shows no signs of being organic (i.e. exponential). yeah I get that, a common refrain from conspiracy theorists is "whadda the chances"
Actually I consider NIST punting on explaining how a frame comes apart from a single column failure on a single floor. Assuming that this failure was the beginning of the visible undoing... they need to *finish* the jib. Their sim looks nothing like what we saw.... no? ... Their sim looks nothing like what we saw.... no? The sim shows that this building will (or can) collapse completely, with or without impact damage, once fires undo a girder on c79. How exactly it will look from the outside depends on the exact nature and extent of the impact damage, and no doubt on the nature and extent of fire damage, and the condition of the as-built frame (as opposed to as-designed) after a couple of decades wear and tear. You can't hope to model all these circumstances perfectly, and the stark difference between the "w/ impact damage" and the "w/o impact damage" illustrates the span of variety in external appearance that arises from the unknown details. What engineers need to learn from this happens in the early stages, well before model progression deviates perceivably from real world progression. Yes. I'm going to make a bit of an off-topic comment here, but which relates to what you said. I have been following the Standing Rock protests and what you said there fits right in to claims being made about how police are supposedly AIMING their non-lethal weapons at certain parts of people's bodies. It seems that wherever someone got hit (if it's a particularly sensitive area like face or head or crotch), they conclusion is jumped to that that is where the police were AIMING the shot to hit the person. Again, it's just more of your idea that something which has happened can't have been just happenstance because probability seems to be against it happening just that way. So what? I have to ask this again: So what? The real collapse looked like a CD - it doesn't matter what it looked like to a casual non-expert observer. Confused WHICH people? Qualified engineers to whom it does concern, or non-experts from the general population with weird hobbies? Why should NIST give a damn what confusion the latter group might suffer from? ANY engineering report is bound to confuse a lot of its unqualified readers. That should not be reason not to publish them. b) Particulars of the later stages of that global collapse depend on guessing input values for the incompletely known details of the structure's conditions at collapse start, hence there should be no expectation that the sims look exactly like the real thing? Can't you see that the sims however do look A LOT like the real thing any many significant aspects? An expert is a person who not only has the relevant education and professional experience (250-500 signers might fall under those categories, if you feel magnanimous) but is also sufficiently familiar with all the pertinent facts of the subject matter. My wife has been a professional Civil Engineer for 20 years. She works in the environmental field and does compliance audits for companies that deal with hazardous chemicals. She makes sure that their spill plans and safety training are up to date. Does this make her an expert on structural failure of a high rise building that was hit by an airplane and collapsed, due to massive structural damage and un-fought fires? Absolutely not. But if she signs A&E911's petition, they would count her as one. NIST's report is not strictly an "engineering report/study" for the engineering community. It was impaneled to explain to the people how 3 massive towers each collapsed in less than 20 seconds. Their report should be comprehensible to average persons ... as well as technically trained ones. It was authorized by the congress. which represents ALL the people of the United States in case you missed that. If they were doing an scientific or professional paper it would have been published in a journal and all the data and so forth would have been available and it would have been peer reviewed. In a gross manner the sim shows a total building collapse with some resemblance to the real event. I am not impressed with it. Total collapse does not quality in my mind as a facsimile of the real event. The entire report is based on assumptions.... not ONLY real world data which there was very little of. And who decides what TRUE and FALSE Authority is. Is true authority whoever tells you what you prefer to hear? It is ridiculous that this simple problem has dragged on this long. I worked for IBM once upon a time. They introduced a machine called a Datamaster 23. It replaced the 5100. I wanted to know how much faster it was and was annoyed that IBM had not provided benchmark data. I was on the night shift and had access to both machines at my local division headquarters. I wrote my own benchmarks, a bubble sort and a prime numbers program. The old machine was almost twice as fast as the new one. Authority is irrelevant. Think and try to understand for yourself. The people who believe in AUTHORITY will get on your case when you do not think what you are told. Tell that to AE911. The issue here is that they are claiming that Ketcham's statement has some special significance because he worked at NIST. It's an argument from false authority. I'm not sure what this example is intended to illustrate. So, you are suggesting the entire premise of AE911 is irrelevant. Interesting. I agree with the OP, the claims from "experts" are not supported with evidence, only talk. I think he's trying to point out that he wasn't "an authority", but his tests showed something "the authority" (ie IBM) didn't' want known - ie testing and data is more important than "authority" - which I think we all agree with? Sure, assuming you have identified actual claims, are doing the right tests, and looking at the right data. His example just says he got a new computer and found it was slower than the old one for some programs he wrote. And that is the key difference to the Ketcham case: psikey had access to the very thing to study and did study it, whereas Ketcham is very explicit that he never had access to the NIST investigations. So Ketcham is not an authority by virtue of qualification, nor is he an authority by virtue of knowledge of the subject matter (which would be internal information about the conduct of the NIST investigation teams, or access to NIST's internal data). There is a lot of off topic posting here. The topic is the former NIST authority. Posts discussing other things will be deleted . ...except that Ketcham isn't making an appeal to authority, is he? He's not saying "I'm an expert from NIST and therefore my opinion is more valuable than yours". Neither is he saying "the opinions of NIST structural engineers are more valid than yours", which is an appeal to authority I often see employed by "debunkers". No, Ketcham makes a list of objections to NIST's methodology and conclusions that can be made by anyone who has taken the trouble to examine them. Almost all the posts on this thread are at pains to ignore and overlook the actual points Ketcham has made by attacking his "false authority" instead. The logical fallacy Mick has introduced here is not argumentum ad verecundiam but argument ad hominem, and most of the posters have followed suit. Then why mention his position at NIST except to add weight to his assertions? Then his working as a been counter at NIST makes him no different than anyone else. Why make him seem like a whistleblower who is revealing a "fraud"?????? AE911 are claiming that there's something significant here because, as their email headline puts it "BREAKING NEWS: Former NIST Employee Speaks Out". But this is not a thread to talk about his talking points or claims of evidence or opinions, this is a thread to talk about how AE911 is appealing to false authority only because he is a former NIST employee. You are a regular here, you know that all his points are debated in other threads. Peter Michael Ketcham [...] had no involvement in the 9/11 investigation (or any other investigation), and has no background in structural engineering or physics. The discussion is clearly about why is AE911 giving extra weight to Mr Ketcham only because he is a former NIST employee. Do you disagree? Whatever weight Mr Ketcham's remarks deserve resides in their salience, and if AE911 or anyone else thinks they are salient enough to draw attention to it is his points, not his position, that should be discussed. Of course you will deflect attention from his points by claiming they have been discussed elsewhere; if I was to repeat or rephrase then effectively that would become your justification for deleting them. But I am far from a regular here. I regard the site as a repository of logical fallacy and distraction precisely because no-one here will be allowed to cogently discuss the cogent points Ketcham has made in a thread that introduced them. I'll pop by next time I feel like wasting my time on the bus. Good day to you all. Is there any objection that Ketcham makes that is new, original, even noteworthy? One that has not been made ad nauseam by AE911Truth and its more visible supporters many times before? Then please spell out (quote) that new and remarkable objection (or those, if you can spot more than one)! I am sure you will agree that he says nothing that hasn't been said by everyone in and around AE911T for years and years again and again. Please answer straight and honestly: Would AE911Truth have run the exact same news release, if the exact same person Ketcham had written the exact same words in the exact same place, with only one difference - that he was not with NIST, and with some other random company instead? Provide reasons for your "yes" or "no"! As pointed out, AE911T is doing exactly that. It is touting his being employed by NIST as if that means something wrt authority. Too bad since if he were saying that he would be demonstrably correct. Structural engineers, especially those with experience in forensic engineering are valid experts/authorities. An appeal to authority is only a fallacy when said authority is fallacious. So you would agree thst his objections carry as much cache as for instance , Charlie Sheen's? What is there new to discuss? What makes him an authority to make such claims? And they continue to do this, now adding him to the roadshow. It's false authority. AE911 are not quite so deceptive here, but still tout his UL experience, and status as a "scientist" (he has a BS in chemistry) as relevant. Kevin Ryan, former lab manger and scientist at Underwriter Lab finds significant discrepancies in the USA's official 9/11 World Trade Center reports. Kevin has read the entire 10,000 pages of the reports. He explains in detail why the report is not accurate and in many cases is misleading. But like Ketcham he's just some guy who believes the AE911 spin. Again, the topic here is false authority, not your opinion of other members here, and not what you think about the NIST report. What about this claim by Ketcham: "First, if NIST truly believes in the veracity of its WTC investigation, then it should openly share all evidence, data, models, computations, and other relevant information unless specific and compelling reasons are otherwise provided." Doesn't his experience give him true authority to speak on policies and procedures within NIST? Not really. He can only speak of his personal experience, unless he's got documentation to back up the claim that this is actually NIST policy. Ketcham just did mathematical visualizations, not investigations. It's somewhat besides the point, because NIST says there IS a "specific and compelling reason" not to - so the question is if Ketcham is qualified to judge the reason.